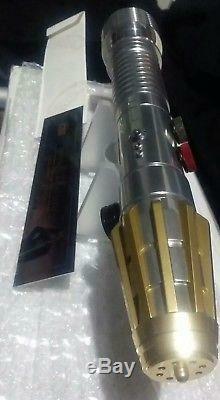 This saber has an amazing the finish is not powder coated that can chip its ionized silver finish that holds up way better no scuffs or scratches on it super sturdy feels great in your hands when you hold it you will know the quality and work that went into it the chromed emitter gold accents in the pommel fins yellow accent led flashes when battery is low it also mimics the blade effects is a beautiful touch has 20mm speaker but very loud and very clear sound I truly hate to part with it but I have to unfortunately. It has the Igniter 2 soundboard this was made special not offered sd access is right behind the led just unscrew the emitter and led set screw and you will have access to the sd card to program It drives an Z6 RGB LED brightest on the market in my opinion to experience TruColor now any blade color is ready with a twist of the wrist Experience the brightness. Experience Multi-Die Clash at its full potential. You can now have any color not only for your blade color, but for your bling-on-cling effects as well! Experience 16 different sabers in one - with 16 different banks you can have 16 different blade colors and sounds to match. Create a dark, light, grey and anything in between, all configurable via the config. Ini file and selectable by simply pressing the aux button to get to the next font. And with with MultiPhase, it is possible to match any hum with any other sound set, giving a total of 16 x 16 = 265 total sound combinations! With Blast Shade, Clash Shade, and Blade Shade experience multiple shades for your blade and effects colors in one font! Experience Saber Dual Phase, the ultimate feature in color! Now you can transition between two different colors with the flick of the wrist. Behold the power of Saber Apps, the first saber OS that allows an infinite possibility of experiences for your saber. Load configuration apps, games, and even the Spark Color firmware all on one saber! Supports 22050Hz, 16bit mono wav files. Supports TruMix with Auto-Compressing Technology which supports crystal clear mixing of sounds without the need to pre-mix them. This allows for any hum to be used with any other effect sound, allowing endless possibilities for sound font creation. Supports up to 16 different sound fonts, which can be used to store different sounds and different settings for blade effects, swing settings and clash settings. Supports up to 99 sounds of each effect per sound font. You will never again worry about hearing the same sound twice! Live the movies as you use Saber Cinema; play your favorite tunes, and still use your saber with light and effects sounds, all while the music is playing! Comes with 8 Accent LEDs pads, 3 being easy solder that can be used to drive up to 8 Accent LEDs. Choose from one of the 8 patterns including "Random", where it cycles through all patterns randomly. Patterns speed/effects are completely configurable, so you will never run out of fresh ideas here! Adjust colors on the fly just point it down and experience the duel phase super fun to play around with. Thus saber was always kept in a display case never dueled with its in the same condition I received it in. Plaque included no blade though or stand. You will receive the saber and the plaque oh and a very deep blade depth once the retention screw is tight that blade is not going to budge. I hope it finds a good home thanks for looking and mtfbwy. The item "Star Wars Luminara Unduli custom lightsaber Igniter 2 Z6 RGB led YouTube link" is in sale since Monday, May 7, 2018. This item is in the category "Collectibles\Science Fiction & Horror\Star Wars\Products, Non-Film Specific\Lightsabers, Weapons". 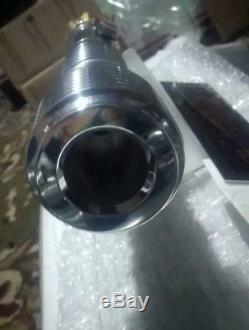 The seller is "joshubosto_0" and is located in Huntley, Illinois. This item can be shipped to United States, Canada, United Kingdom, Denmark, Romania, Slovakia, Bulgaria, Czech republic, Finland, Hungary, Latvia, Lithuania, Malta, Estonia, Australia, Greece, Portugal, Cyprus, Slovenia, Japan, China, Sweden, South Korea, Indonesia, Taiwan, South africa, Thailand, Belgium, France, Hong Kong, Ireland, Netherlands, Poland, Spain, Italy, Germany, Austria, Israel, Mexico, New Zealand, Singapore, Switzerland, Norway, Saudi arabia, Ukraine, United arab emirates, Qatar, Kuwait, Bahrain, Croatia, Malaysia, Brazil, Guatemala, Honduras, Jamaica.